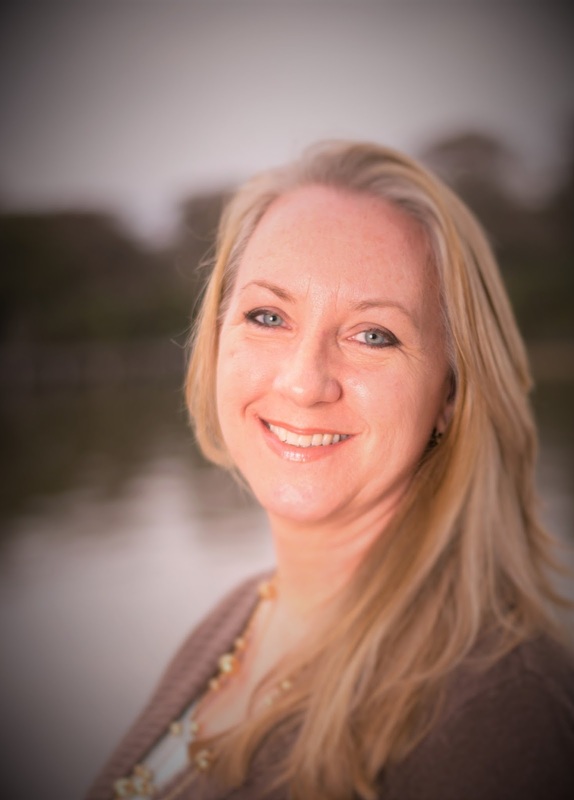 Michele Morris here on Heroes, Heroines, and History. The Straights of Mackinac are a narrow, relatively shallow waterway connecting Lake Huron and Lake Michigan. The shortest distance across the Straits from Michigan’s Lower Peninsula to the Upper Peninsula (UP) is about five miles. It’s across this stretch of water that The Mackinac Bridge was built. 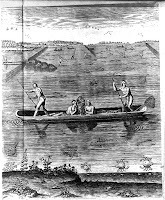 During the seventieth, eighteenth, and nineteenth centuries, people traveling from one peninsula to the other used canoes or boats to cross. 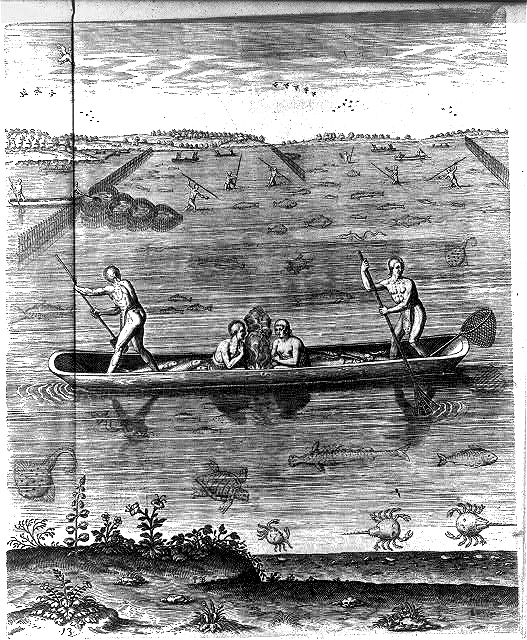 The crossing was dangerous and during winter, almost impossible until the waterway completely froze over. As early as 1880, Michigan Legislators began discussing the construction of a bridge spanning the Straits of Mackinac. Then in July 1888, on Mackinac Island, during a meeting of the board of directors of the Grand Hotel, Cornelius Vanderbilt II introduced a plan to build bridge across the Straits. His goal was to expand business in the area and help lengthen the resort season of his hotel. The design he proposed was similar to one under construction across the Firth of Forth in Scotland. Though plans for a bridge were ahead of their time, ways to make crossing the waterway more efficient continued to pass through Michigan Legislation and discussed among local businesses. also became more expensive for the state to maintain. After only five years of ferry service, Governor Fred Green ordered that the same agency that ran the ferry system to research the possibility of building a bridge. Their findings were positive. The estimated cost was 30 million dollars. There were steps taken to get the project underway but soon the project was dropped until 1934 when Michigan Legislature formed the Mackinac Straits Bridge Authority of Michigan. At this time, The Bridge Authority conducted another study of bridge feasibility. Their findings were similar to the 1923 study, and it was concluded that the bridge could be built for approximately 32,400,000. 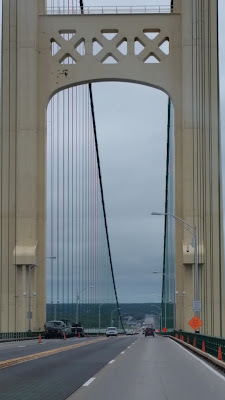 For the next ten years the Mackinac Straits Bridge Authority worked diligently to raise funds and obtain federal grants, but unfortunately due, in part, to World War Two, the Bridge Authority was abolished and all plans for a bridge across the Straits were put on hold. 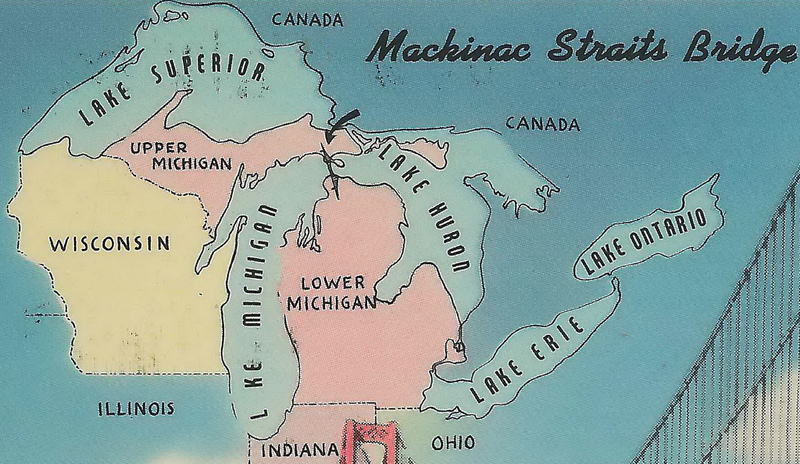 Soon after the war ended The Mackinac Bridge Authority of Michigan was reinstated and exists to this day. It took another ten years of fundraising and planning before bridge construction took place. 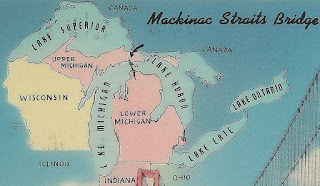 Ground breaking ceremonies were held on May 7th, 1956 in Saint Ignace (Upper Peninsula side) and on May 8th in Mackinaw City (Lower Peninsula side). Mackinac Bridge construction began with the erecting the pillars. Caissons (footing) were built off site then floated into position and sunk to provide a foundation for the two main towers. Cables would be connected to the two towers and would serve to support the center span of the bridge. Creeper derricks (crane type machines) were added, to raise materials for construction. Truss sections were built in sections and floated into position then raised into place. Right on schedule, the Mackinac Bridge opened to traffic on November 1, 1957. The auto ferry service discontinued runs on the same day. On June 25, 1958, the Bridge was formally dedicated. The following facts and figures are quoted from David Steinman's book "Miracle Bridge at Mackinac". Total Length of Bridge (5 Miles) - 26,372 Ft.
Total Length of Steel Superstructure - 19,243 Ft. 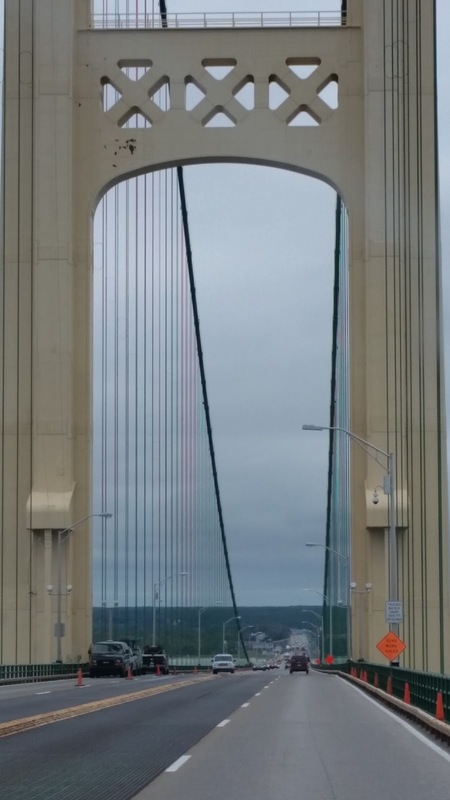 Length of Suspension Bridge (including Anchorages) - 8,614 Ft.
Total Length of North Approach - 7,129 Ft. Length of Main Span (between Main Towers) - 3,800 Ft. Maximum Depth of Water at Midspan - 295 Ft. Maximum Depth of Tower Piers below Water - 210 Ft. Height of Roadway above Water at Midspan - 199 Ft.
Under-clearance at Midspan for Ships - 155 Ft. Maximum Depth of Water at Piers - 142 Ft. Maximum Depth of Piers Sunk through Overburden - 105 Ft. Thank you for joining me here at Hero, Heroines, and History. Interesting history about the Mackinac Bridge. A friend who grew up there has shared her stories with me, which I've enjoyed. Thank you for the comment, Marilyn. It's a beautiful bridge, although a little scary to cross!